It’s game day. We’ve been working toward this for almost a year. It’s just dawn and I’m watching a dull orange glow creep up the eastern sky. The 6 a.m. outdoor alarm just went off at the factory building, indicating that it is time for the workers to start their day. They start early here because many of them are farmers as well, and will go home in the afternoon to work their second jobs. Our job this morning starts with getting the staff, volunteers, and vendors parked in the main field. Yesterday we carefully checked all of the parking fields with a heavy truck and a bunch of volunteers, to identify potential wet spots. There’s a section in the northeast corner we call “Lake Bambi,” and there are two smaller spots we call the South and North China Seas. They are pretty wet, so we have marked them off. There’s also a section we had coded-named “Cairo” that we won’t be able to use even though it is mostly dry, just because we can’t get to it. But otherwise the field is drying out very nicely. In the morning I estimated we could use about 80% of the available spaces, but at the rate things were drying we might be up to 90% this morning. We had a nice hot breeze all day and lots of sunshine. In any case, we’ll have no trouble parking everyone who is signed up for the event. 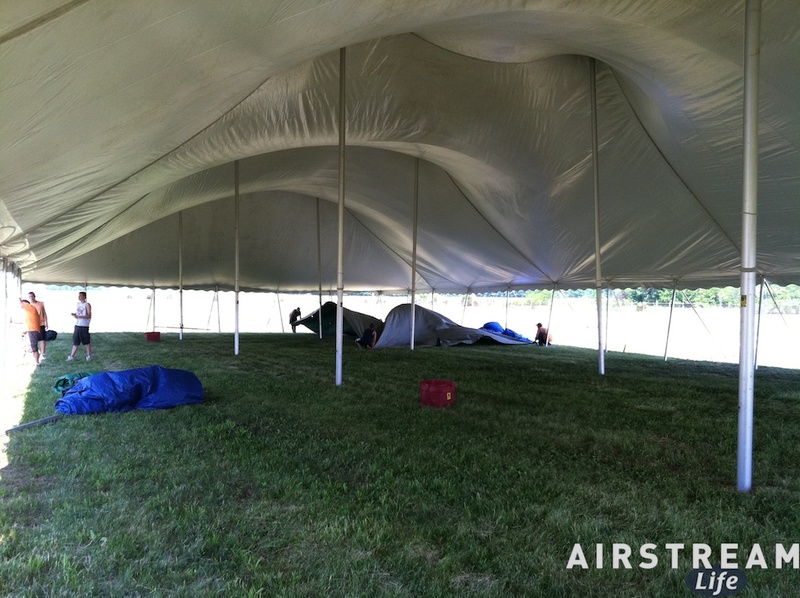 The tent went up yesterday, and it is just plain huge. We’ve got room for 450 people in there, plus a large stage. It’s the first things you see as you arrive. Looks like the circus has come to town. There are three smaller tents too, for registration, yoga classes, and vendors. The Terra Port filled up yesterday, as we expected. 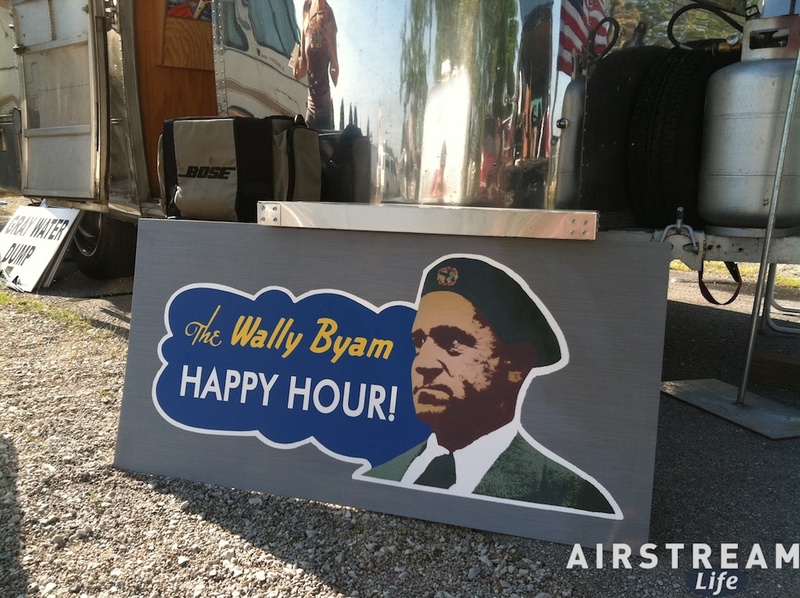 Adam and Susan are here in their unique Class C, Alex and Charon showed up with Laura (from our Anza-Borrego trip last December), Kirk the amazing sign guy showed up with his usual bag of swag plus this cool Happy Hour sign, plus Michael Depraida, Hunter Hampton, and many other well-known Airstream characters. With all these people, it wasn’t surprising to see a couple of big chat circles set up under the shady trees every afternoon. Eleanor and I had enough to do that we didn’t have time to join them for more than a few minutes. She was off until mid-afternoon making an airport run again, and then we needed to go back to the tent area to drop off the registration trailer (a U-Haul) and set up some things in the main tent. Then I had to go out with Brett & Adam to set up signs on the entry roads (which look awesome, by the way, thanks to Kirk). 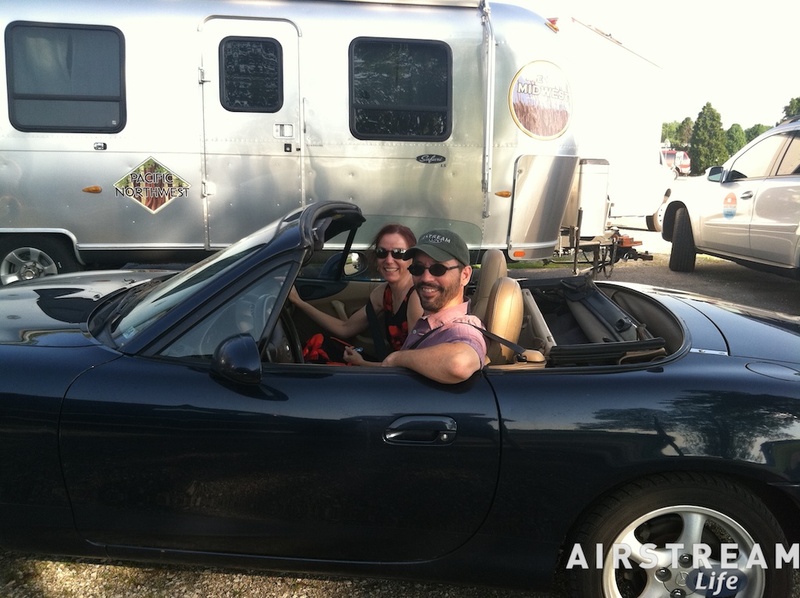 We finally got a chance to clean up and break away around 6 p.m. in the Miata for a top-down cruise through the countryside — just us, away from the bustle and crowd for a few hours. We zipped down to the old downtown of Sidney, checked out a few quiet spots in town, then had dinner and came back via the Interstate. The convertible is surprisingly habitable at highway speeds, especially on a night like last night when the temps were still running about 88 as we cruised home. Things are heating up for us in all sorts of ways. We were blessed with a sunny day, temperatures in the upper 80s, and a nice breeze all day to dry things out. With more sunshine forecast today it looks like we’ll have no trouble using the grass to park trailers on Tuesday. Eleanor and I took a trip down to Dayton airport to meet my mother and hand off Emma. She’ll be winging it back to Vermont today, and we’ll see her again in about ten days. On the way back, the Mercedes was running very low on fuel, so of course I stopped to buy diesel. The combination of a nearly-empty tank and high Memorial Day fuel prices set a record (for us) for most expensive fill-up ever: $108. I know for a lot of folks with big truck tanks a three-digit fill-up is commonplace, but this is the first time I’ve ever spent that much for a single fill-up on any vehicle I’ve ever owned. It’s a psychological shock, that’s for sure, but I’m reminded of what people told me when we first started full-timing in 2005. Back then gas was running about $2.80 per gallon and I heard, “Boy did you decide to go traveling at the wrong time. Wait a while until prices drop again.” I’m glad we didn’t wait. It always seems expensive at the time, but having been to Europe and paid $7 a gallon I know that we still have a cheap deal here. Another pair of key Alumapalooza volunteers, Lou & Larry, showed up last night. They are our dear friends from eastern Ohio, with whom we’ve courtesy parked many times. This week they are also the Vice-Presidents Of Parking, or whatever title they care to give themselves. Parking is the toughest job at Alumapalooza, and with the tricky logistics caused by all the rain recently, we are going to spend a lot of time today wandering the fields so we can finalize our strategy and be ready for the onslaught of 100 Airstreams that is coming tomorrow. 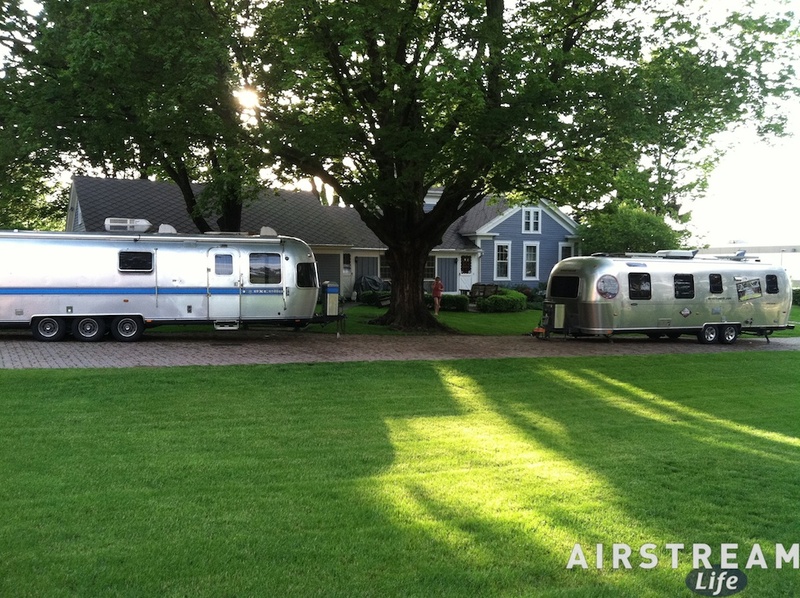 We’ve landed in Jackson Center, OH, home of Airstream since the 1950s. There’s a sort of reliability about coming here, because not much changes between visits in a village this small. Because it is so small we tend to notice the little things, like the fact that one restaurant has closed and another has opened, or that the BBQ place has a new sign. In Tucson they could demolish an entire city block and we might not notice for a week, but here we can notice a new crack in the pavement as we stroll through the four-block downtown. On this visit my primary interest is getting prepped for Alumapalooza, so I’m more interested in the grass fields and parking lots around Airstream than anything else. After incredible and constant rains, it appears the weather pattern has finally broken and we are expecting a mostly sunny week. That’s good, because the local farmers haven’t been able to plant (costing an estimated $904 million in lost farming revenue in this state alone!) and they need some drying weather soon. Of course, we do too, but I walked the Airstream fields yesterday and could see that with just a couple of days of no rain we’d have no problem using 80-90% of the available space. So by Tuesday, when 100 trailers are scheduled to arrive, we should be fine. At the moment hardly anyone is here, which is ideal. The factory is, of course, closed for the weekend. 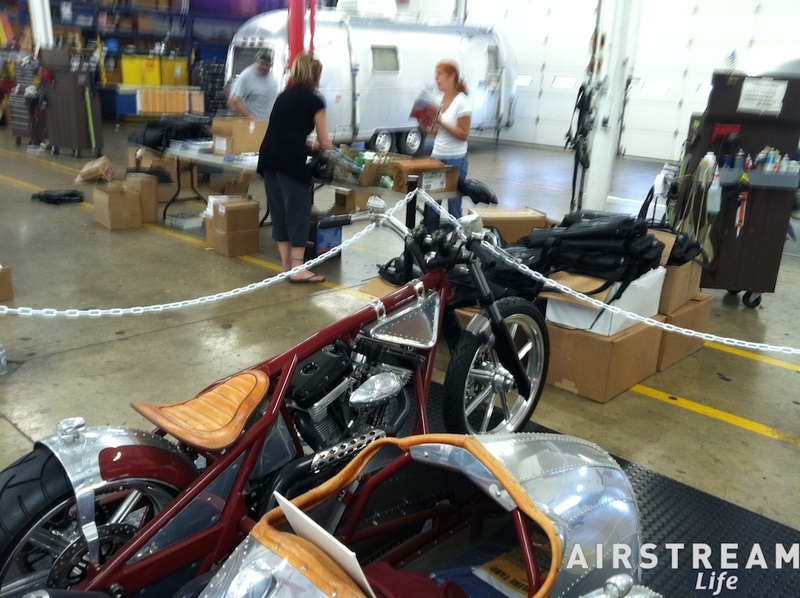 Last year the Airstream “Terra Port” filled up with early arrivals, which is something we try to discourage since the Terra Port is for Service Center customers. It was a bit of a madhouse, especially by Monday when the last space was taken. This year something has kept people away — maybe the weather? In any case, it’s quiet and that will be great for us since we’ve got a lot of things to do. Tim & Alice came here on Friday, Brett & Lisa arrived yesterday morning, and we arrived yesterday afternoon. 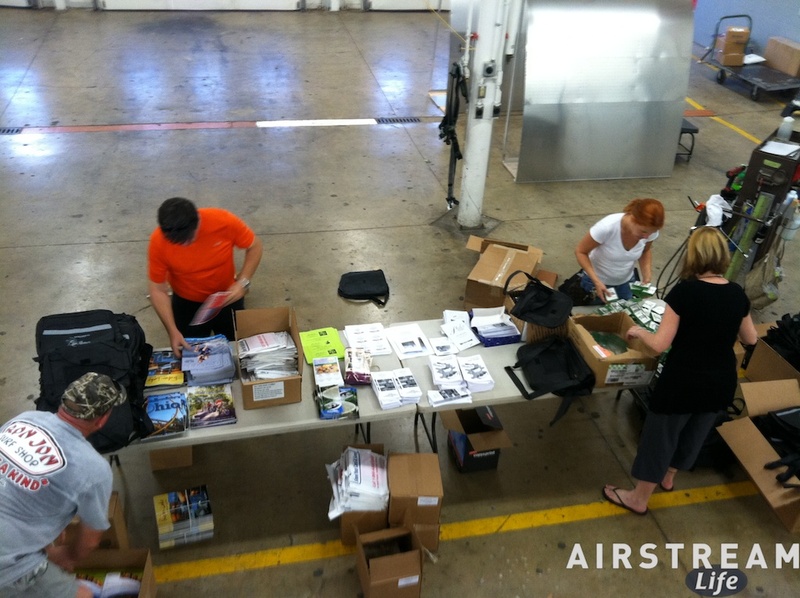 Today our jobs are to pick up some boxes of donated materials, stuff goody bags, and strategize parking scenarios, plus make a run to the Dayton airport. Not bad, so I’ll also have some time to get work done before the real madhouse begins. It’s a weird way to spend Memorial Day weekend, but all for a good cause. After that, Charlie led me to the incredible Tippecanoe Place Restaurant in the old Victorian district of South Bend, just for a quick look at the interior. It’s a large 1880s stone mansion reminiscent of some of the eastern Vanderbilt homes, resplendent in carved oak and fine craftsmanship. Absolutely beautiful, and well worth a visit. It was the home of the Studebaker family for over 40 years. Studebaker, if you didn’t know, was based here in South Bend, and at one time employed 21,000 people on an enormous factory campus with over 150 acres under roof. 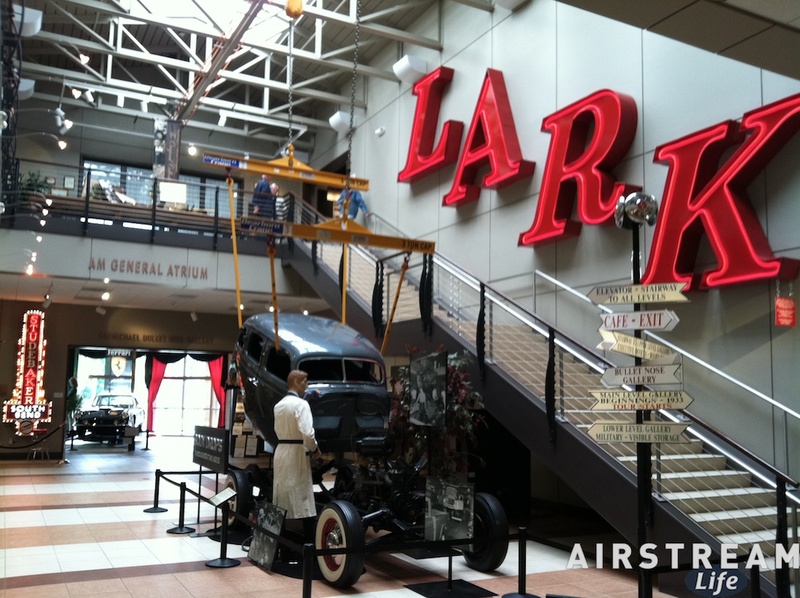 So our next stop was, of course, the Studebaker National Museum, just around the corner. It’s a pretty nice example of a single-brand car museum, with about 70 drool-worthy cars on exhibit at any given time. For eight bucks it’s a decent deal for any car buff, or anyone who appreciates industrial design. We’ve never really explored South Bend on our prior visits, so this is the first time I’ve had a chance to appreciate what the town has to offer. It has many small and large legacies of its industrial heyday scattered around, from Victorian homes to city parks and museums. Of course, not all of the legacies are good — in many places you can see the slow slide into urban decay as major manufacturing continues to depart, either from being exported overseas or simply driven out of business. Yesterday I got out to Lowe’s for some materials, and spent about half an hour building a little deck from 2×2 and 1×4 boards and a bunch of wood screws. The deck is about 3×4 feet, and will be placed at the entryway of the Airstream this summer while it is parked in Vermont, to provide a place to put shoes and reduce the gravel that gets tracked into the trailer. We started carrying a miniature 1×1 ft. version of one of these decks last summer and it has proven very useful for muddy spots (much better than the entry mat, which just gets wet), so the one I built is just an expansion of the same strategy, for our long stay. 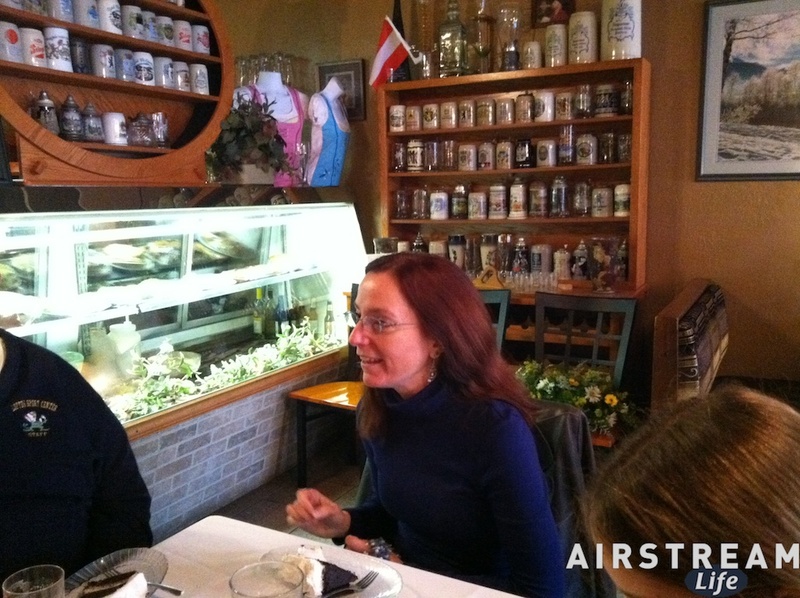 Tonight we joined about 20 of Charlie & Lynn’s friends and family at Moser’s Austrian Cafe, in nearby New Carlisle IN. I don’t know why we were in a small and obscure downtown German cafe, out of all the places we could have gone, but it turned out to be a fine place to have a celebration. In this case, the celebration was sort of a combination of themes: their anniversary (which was months ago, apparently), and their impending departure to Minnesota, and I suppose our mutual general love of Charlie & Lynn. At least, that’s how it looked to me from the many happy faces. Whatever — we were gate-crashing strangers to nearly everyone there and had a great time anyway, which says something about the kindness of their family and other friends. I wish I could have managed to hold my camera while driving I-80 from Joliet IL to Gary IN yesterday, but I was too busy juggling the steering wheel and the walkie-talkie. The pictures I would have captured would show an uneven concrete jungle crowded with speeding 18-wheelers, bridge construction, sudden slowdowns, and in the midst of it all, an Airstream trying to avoid being smashed from three directions at once and a tiny Mazda Miata cowering in terror, dwarfed even by the wheels of the trucks. It was a final test for Eleanor, who has borne up well despite 1,900 miles of bone-rattling driving across the country in a ragtop car that has no soundproofing. The I-80 assault was noisy even in the pampered environment of the Mercedes. (I almost had to increase the volume on my iPod, boo hoo.) In the Miata it was a deafening rumble of tanks crossing the desert sands of Iraq, a bladder-loosening flyover of B-17s in diamond formation, and a 7.5 earthquake in Japan, all at once. After nearly an hour of physical and mental abuse, we reached the relative peace of the Indiana Toll Road and pulled out to a rest area, where Eleanor collapsed for half an hour in bed. But she survived, and recovered well enough to drive the last fifty miles. And now we are here in South Bend, parked on carefully-laid pavers next to an antique farmhouse, surrounded by a few well-manicured acres of grass and horse pasture. The contrast from the noisy, smelly, crowded, and cracked I-80 Death Race Challenge is so dramatic as to seem unreal. The 34-foot Excella belonging to Charlie and Lynn is parked with us, stocked and nearly ready to go for their upcoming trip to Minnesota. 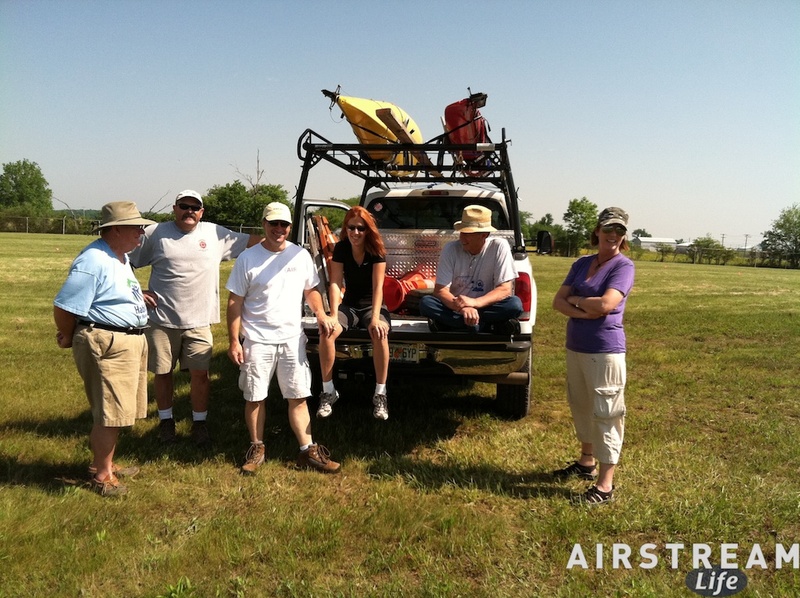 We have been here many times before, and it has always been an oasis for us at the intersection of Chicago, Michigan, and Airstream. We’re ready to relax and catch up on things for a couple of days. This is great, and crucial, because I am supposed to have the Fall 2011 Airstream Life magazine completed for layout by next Wednesday. That isn’t going to happen, because Alumapalooza makes it impossible for me, but I at least will get 3 or 4 articles in process so that the entire magazine isn’t held up until I return to it. Today and Friday will be dedicated in part to getting a bunch of editorial work done. Fortunately, I have been greatly assisted with this issue by Associate Editor Tom Bentley, and at this writing I am also working to bring another Associate Editor up to speed for Winter 2011. You may have noticed that photos in the blog for the past week have been of lower quality than usual. That’s because I have been experimenting with using my iPhone as my “point and shoot” camera. It is highly convenient but the photos aren’t great. In particular the iPhone is very contrasty and can’t handle low light at all. It also lacks optical zoom, and any sort of manual control over the image. So when I get to Jackson Center I’ll switch back to the Nikon D90 for Alumapalooza pictures. We have been granted a huge boon. Five months of awful weather in Ohio have finally broken, just in time for our event. It has rained almost continually and will do so again today, but as of Saturday the sun is forecast to shine — and keep on shining — with very little prospect for rain next week! Of course, the ground is wet and may not dry out entirely by Tuesday, but we have contingency plans to temporarily park arriving trailers on pavement if needed. Personally, I think we’ll be fine to start using the field by Tuesday or Wednesday. The ace Alumapalooza parking team of Lou, Larry, Terry, Brett, myself, Alex, Charon, Laura, Alice and Tim will all be on site in advance to finalize our parking and utility strategy. Plus we’ve got support from Lisa, Eleanor, Kirk, and several other folks if we need it. So when 100 trailers arrive on Tuesday, we’ll be ready for ’em. Look for us in the orange t-shirts, bearing walkie-talkies and trying to look competent. The forecast suggests the usual JC weather pattern next week. It will be damp and cool in the mornings, so you’ll come out of the trailer dressed in long pants and a jacket. Shortly after, the fog will burn off and you’ll be roasting hot in the sun, so you’ll have to change clothes and find some sunscreen. That evening, the temperature will drop suddenly after sunset. At least once during the week a shower will pop up with little warning, too. It definitely is a place where the old adage is true, “If you don’t like the weather, just wait a while and it will change.” Keeps things interesting, I say.